I dragged my feet about going to The Exorcist because of the gimmicky subject, and the adverse reviews I saw made me purr at my prevision. But this film about the diabolic possession of a 12-year-old girl has become such a huge hit that I thought I ought to grit what’s left of my teeth and investigate. I’m glad I did. In this case, anyway, vox populi vox diaboli. This is the most scary picture I’ve seen in years —the only scary picture I’ve seen in years. (Though I admit I don’t see many “horror” films. Too unhorrible.) I haven’t been more scared by a film since Mary Philbin snatched the mask off Lon Chaney’s face in The Phantom of the Opera in 1925. The reference to childhood is particularly apt because the point of The Exorcist is to cut through everything we’ve learned and cultivated, to get down to the talent for fright that we are virtually born with. I haven’t felt so much like Robert Warshow’s “man watching a movie,” his homme moyen, since the same director, William Friedkin, did it the last time with his (quite different) French Connection. Friedkin seems to have found his forte. He started serious (The Birthday Party, The Boys in the Band), but there he seemed strained, and obtrusive —like a tumbler in a ballet. Evidently what he needed was material where nothing mattered but the effects. 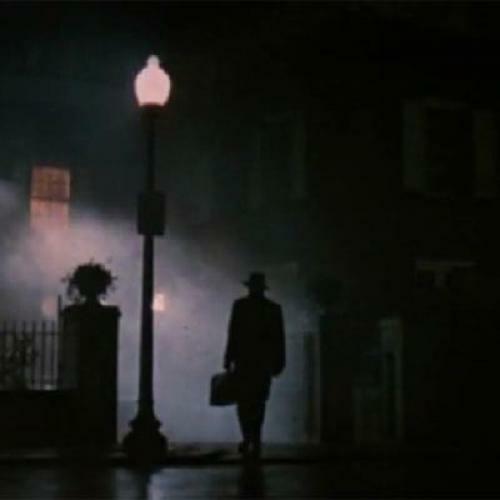 The French Connection showed he had real gifts for gut punching; The Exorcist shows his gifts for chilling the spine. This new picture starts slowly: there’s a lot of background material to be laid out and some of it is lingered on excessively; but when Friedkin centers on his main material—the possessed child in modern Washington, DC—he handles it with very exceptional skill. The cutting, the lighting, the sound track and, above all, the special effects have been ordered up carefully by the director and used precisely. Even the music is faultless—most of it by Krzysztof Penderecki, who at last is where he belongs. During most horror pictures that I see, I keep watching how it’s done and waiting for it to be over. Here the directorial hand is quicker than the eye; and ear. Here I got frights and the pleasure of unmediated visceral response. Disbelief was canted, if not suspended, so that I could watch the story play out. And virtually all of this was Friedkin’s doing. William Peter Blatty wrote the screenplay, from his own best-seller, and produced the film. I haven’t read the book and certainly won’t now—I’ve had these jolts—but in the film script, anyway, there are some matters left unfinished. A prophecy that the possessed child makes about an astronaut: does it come true? What about the Washington detective (Lee J. Cobb)? Did he just quit investigating the case? The specific occasion for the Satanic invasion is only vaguely hinted at, and then only at the end. It has something to do with a small silver religious medal that an archaeologist-priest dug up in Iraq; but how it got to this Georgetown house is never told us. If I’m putting this together right, then a point of irony was muffed: because one of the exorcising priests is himself the archaeologist who dug up that medal. The theme of possession is an old reliable: it’s the basis of a chief work in the Yiddish theater, Anski’s The Dybbuk. The idea of the doom-haunted object has worked for dozens of minor writers, including Lord Dunsany and W. W. Jacobs. Blatty has blended the two elements in this story of a film actress (Ellen Burstyn) and her 12-year-old daughter (Linda Blair) living in a rented Georgetown house during the shooting of a picture in Washington. First, the house itself begins to act strangely—inexplicable noises, a shaking bed. Then the child begins to act strangely. Conventional medical procedures are explored; no help. Doctors themselves suggest exorcism. A psychiatrist priest is called (Jason Miller, the actor who is also the author of That Championship Season), and eventually an older priest who knows exorcism well (Max von Sydow). One reason I could go along with all this is that I know such things happen: a few years ago a rabbi told me he had recently been called on to perform an exorcism. Anyway, the ending of this exorcism is meant to provide a touch of Christian martyrdom, but this really doesn’t carry much weight. The ending is a way out of the plot, that’s all, and the plot is all that matters in this supernatural melodrama. The moralistic critics—who invariably object when they happen not to like a current instance of horror or violence, although they may have been caroling the week before about Clint Eastwood or Hitchcock—bemoan the fact that a child is called upon to mouth some obscenities, pretty foul ones, and to perform an obscene-profane action (shoving a crucifix up herself). I don’t see how the child’s satanic possession could have been shown by having her exclaim “Dam!” and by breaking Mom’s favorite vase. And in a world where 5-year-olds in TV commercials parrot stuff about detergents and cereals, with no point at all except selling goods, I’m not upset at Linda Blair’s taking part in what she knew was a fiction. As for the horrors, the only time I had to avert my eyes was not for a demonic scene but for a “straight” scene in a hospital where doctors inserted long needles in the girl’s neck in preparation for x-rays. The Exorcist makes no sense. For instance why couldn’t the devil have done earlier what he does right at the end? It makes no more sense than a musical, has no more ambition toward sense than a musical. In both cases we accept the non-sense for the sake of entertainment. The theater where I saw The Exorcist was crowded with people being entertained by horror; they giggled after most of the possession scenes (after, not during), a sure sign that they had been shaken and had to right themselves. If you want to be shaken —and I found out, while the picture was going on, that that’s what I wanted—then The Exorcist will scare the hell out of you.